Rider on the Capital Crescent Trail by Joe Flood licensed under Creative Commons. Two years ago, a cyclist was tragically struck and killed by a driver at the intersection of the Capital Crescent Trail (CCT) and Little Falls Parkway. After this incident, the local parks service reduced car lanes to one each way and lowered the speed limit. It has worked incredibly well, and Montgomery County should make the changes permanant. Since these changes were introduced, there has been a 67% reduction in crashes, and no fatalities. Traffic has only decreased here by 3%, and drivers have only had to wait for an additional seven seconds on average. The response is well-aligned with the county’s Vision Zero committment and its Two-Year Action Plan to have zero road deaths and serious injuries by 2030. In June, 2018, the Maryland National Capital Park and Planning Commission (M-NCPPC) Parks Service presented a large range of possible permanent alternatives for this trail crossing. Based on data assessment, modeling, and public input, they have narrowed these down to three preferred alternatives which were presented at a public meeting on October 9, 2018. The goal is to eventually present a single preferred alternative to the Montgomery County Planning Board over the coming winter. Here's an overview of the three options. This plan will continue the current road diet but add beautification and design improvements. It would improve lighting, return excess pavement to grass and landscaping, and implement safer and more welcoming pedestrian trails, including a raised crosswalk. This alternative is the most cost-effective (estimated $800,000), has the least environmental impact, and has proven to be safe over the last two years. Under the current conditions, very little traffic has been diverted to nearby streets. 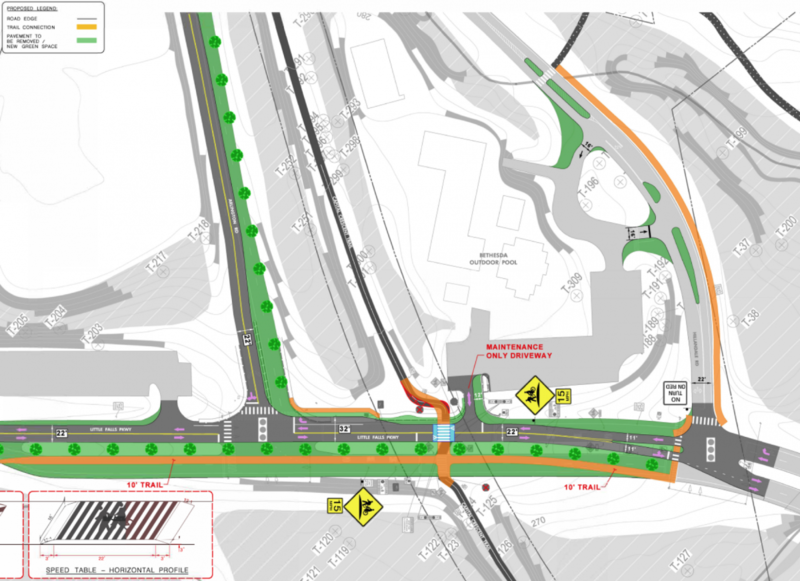 Montgomery County Department of Transportation's (MCDOT) plans for Arlington and Hillandale Roads will mitigate these impacts further, as will plans for the adjacent Bethesda Pool, which includes road diets and other traffic calming measures. With this design, trail users will be safer with minimal crossing delays, and drivers will continue to only wait an average of seven extra seconds over pre-road diet conditions, with no change from the previous two years. Preferred Alternative A: Continue the existing road diet along with beautification, improved lighting and safety, and regional safety measures such as road diets and traffic calming. Image from the M-NCPCC Project Plan Website. 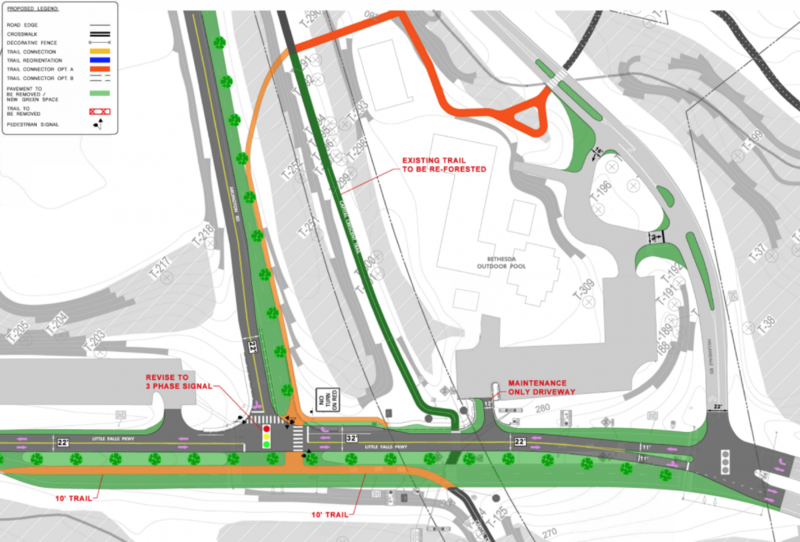 This plan diverts the CCT to the intersection of Arlington Road and Little Falls Parkway, and implements a three-way signal to give dedicated crossing time for vehicles (in two phases) and trail users (in one phase). This design would keep a single travel lane in each direction to decrease vehicle speeds and improve safety. There are many complicating factors with this proposal, however. It is more expensive (estimated $1,500,000), has greater environmental impact, both trail users and drivers will have to wait longer on average (30 seconds and 13 seconds respectively), and there's more diverted traffic is expected over current conditions (an estimated 6%). 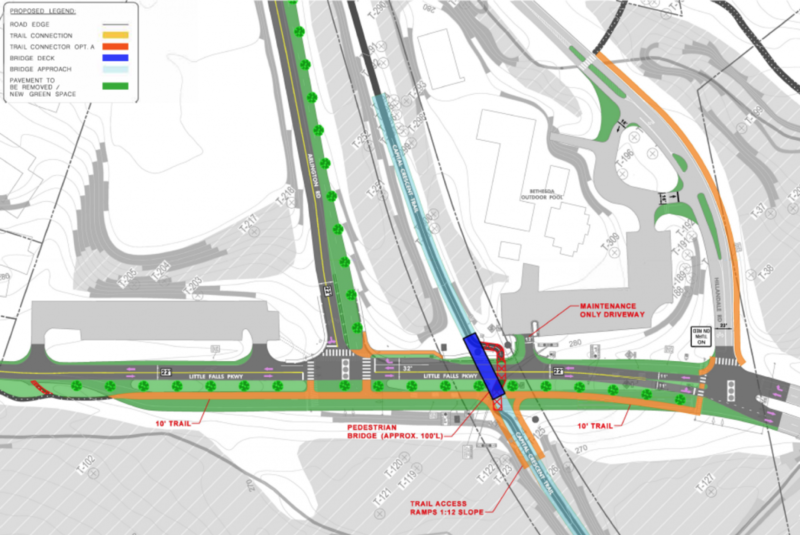 This plan also makes it more challenging to connect the CCT to the nearby Little Falls Trail and Norwood Park, and complex trail plan from the separate Capital Crescent Trail Connector project would likely have to be resurrected. Most concerning, it's likely that both drivers and trail users would be tempted to ignore the signal by either turning right on red or crossing against the signal entirely. Both actions would introduce greater risk. Preferred Alternative B: Divert the Capital Crescent Trail to the intersection with Arlington Road and install a signalled crossing. Regional road diets and calming measures are also proposed. Image from the M-NCPCC Project Plan Website. The most expensive plan (estimated $4,000,000) but arguably the safest is to build a trail bridge over Little Falls Parkway. In this scenario, trail users and vehicles are completely separated and delays are minimized for both. However, the cost is highest, ongoing maintenance costs will likely be far greater, and the environmental impact is the greatest. Given the minimal impact to drivers and the dramatic safety improvements demonstrated over the last two years of the temporary road diet, it seems hard to justify the financial cost and environmental impact of this solution. Preferred Alternative C: Build a completely separated trail crossing in the form of a bridge. Regional road diets and calming measures are also proposed. Image from the M-NCPCC Project Plan Website. The project planning team has presented an informative table comparing the three alternatives along with a default “no-build” option, which highlights many of these points. You can also see a simulated rendering of the plans, courtesy of WTOP. Feedback at the recent meeting was generally positive, but some people had concerns. Some were worried that traffic is being diverted into area neighborhoods, and others wondered how to accommodate predicted regional growth. However, data shows that there was only a 3% decrease in traffic at the intersection during the current interim road diet, and it's likely that even less of it was actually diverted. No measurable increase in traffic has been observed on the nearby Dorset Avenue. The project plan has indicated that traffic may be increased on Hillandale and Arlington Roads, but both will be mitigated by parallel MC-DOT plans for road diets and other calming measures. Traffic in the adjacent Kenwood neighborhood has already been addressed by one-way streets, speed bumps, and rush hour restrictions. Traffic from regional construction and population growth can be addressed by the incoming Purple Line, county plans for bus rapid transit, and improving trail safety as an important transportation corridor. Increasing capacity for predominantly single-occupancy vehicles in the era of Vision Zero and increasingly alarming environmental reports is simply the wrong direction for the county. Ultimately, a seven-second delay is not worth returning to unsafe conditions and potentially having another person killed at this location. This is an excellent opportunity to solidify a positive step towards embracing Vision Zero and improving safety and environmental impact for this area and the county. Alternative A is a safe, cost-effective, and minimally disruptive solution that has been proven to work well over the last two years. Full details including plans can be viewed at the project website. Contact county leaders today to tell them to prioritize our safety and keep the road diet — you can use the form below. Additional comments can also be submitted via an open public forum.